Following are the Highlands Droughtmaster Sale Vendors for the current year (in alphabetical order). 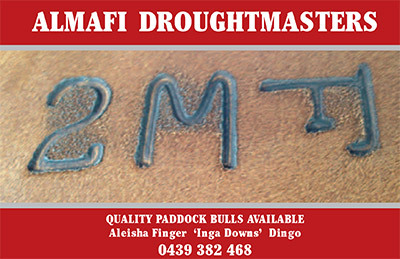 Almafi Droughtmaster stud was formed in 2011 by Aleisha Finger. The stud is based at Inga Downs on the Beef Road between Middlemount and Dingo. There the stud operation is backed by a large commercial operation, ensuring the commercial viability of a bulls. The Highlands Sale will be the first and only public auction this year, we are also selling a select group of bulls privately. With a commercial focus we select bulls of sound structure and a good carcass that are easy doing to ensure they can finish on grass. Heavy emphasis is placed on temperament and fertility and anything that doesn’t meet these standards is culled. We look forward to presenting our draft to you and working to build a strong relationship with our clients in the future. Huntly Droughtmasters is located near Clermont in the Central Highlands of Queensland. Over 50years of breeding and four generations of Barton family ownership, the Huntly herd is focused on producing commercial and environmentally functional cattle. 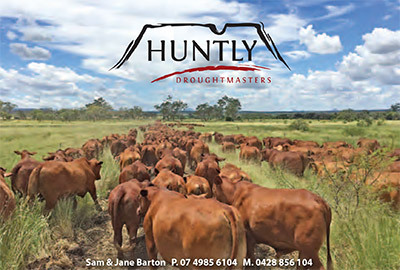 This experience in the beef industry and depth of breeding makes Huntly Droughtmasters the experts that you can trust for your Droughtmaster genetics. 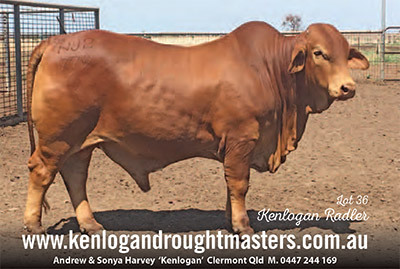 Kenlogan Droughtmaster Stud, No: 715, is a Family Owned and Operated Cattle and Cropping Property situated in the Fertile Black Soil Country of the Mt.McLaren and Kilcummin District, North of Clermont, Central Queensland. The Stud Principle’s are Andrew and Sonya Harvey, who currently run approximately 160 Registered and roughly 320 Commercial Breeders, currently back on numbers due to a few dry years and no agistment available. Nth Qld Droughtmaster Bull & Female Sale, Charters Towers. You will also see the Kenlogan Bulls on display at Ag-grow Field Days in Emerald held every July, and the Central Highlands Show Circuit. The Stud also caters for the Commercial Cattle Producer with Bulls available out of the paddock. Andrew and Sonya focus heavily on producing good, clean quality bulls with: Excellent Temperament ~ Bone Structure ~ Tidy Underline ~ Muscle ~ Scale and Walking Ability. And with our Females: Temperament ~ Bone Structure ~ Udder Development ~ Calving and Femininity. Medway Droughtmasters Stud originates from the ranges of Bogantungan, where we run our breeders of approx 2500 head. 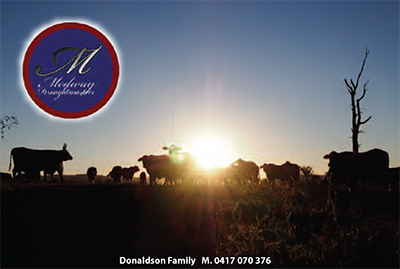 Medway grazing is a family operated business run by the Donaldson family. 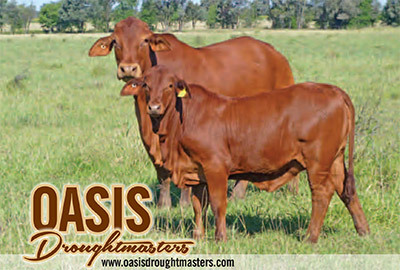 “Oasis Droughtmasters”, owned by the Geddes Family, whose goal it is to produce good quality cattle that will perform in all types of country. Noel and Robyn have a long history within the cattle industry. Noel’s family originated from Yaamba, while Robyn’s family from Banana. Both Noel and Robyn’s grandparents were early pioneers of the Central Queensland area. Noel and Robyn moved to Emerald in 1990, leasing the property “Innisfree”. Three years later, in 1993, they bought the property “Oasis”, north-east of Emerald and first started crossing Droughtmaster bulls over their Brahman cows. In 2002 they founded the “Oasis Droughtmaster Stud” and started selling bulls both locally, and to the Capricorn Droughtmaster Sale at Gracemere. In 2007, Noel and Robyn bought the property ”Rosels”, on the flood plains just south of Rockhampton, where their son, Adam now lives with his partner, Shelley. Today, they continue to sell their bulls both out of the paddock, annually at the National Droughtmaster Sale at Gracemere, and for the first time this year at Highlands Sale, Clermont. 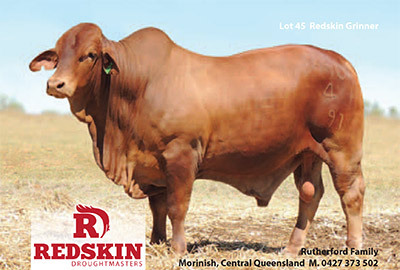 Redskin Droughtmaster stud operated by the Rutherford family was formed in 1981 with a base herd of santa cross brahman females. Bulls are marketed at the National Sale and the Highlands Sale where we have been vendors since its inception in Clermont in 1991. Temperament, structural soundness, fertility and constitution are the attributes we select for in our herd and over the years we have produced sires which have had an influence within our breed. The stud is now based at “Fletcher’s Awl” in Central Queensland. “Fletcher’s Awl” is a 11,317 hectare property which consists of iron-bark and Bloodwood ranges running onto open black soil plains. It is in a low rainfall belt – one year there may be up to 25 inches of rain, but more commonly it runs in the 10-15 inch bracket. Droughtmaster cattle excel in this type of country as they have the survivability and adaptability to withstand the good times as well as the bad. 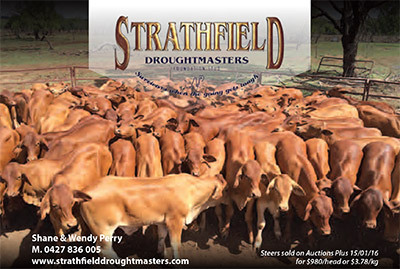 Strathfield Droughtmasters is a moderate sized stud with 200 registered females and 700 commercial droughtmaster cows. We endeavour to breed quality as opposed to quantity. Our results are true testament to the quality of our cattle with Strathfield setting breed average records and topping vendor averages in the sale ring at multi-vendor sales on a regular basis. We don’t select for one particular trait – instead we select cattle with a broad range of desirable traits within the Droughtmaster breed. Strathfield places particular emphasis on selecting cattle with a good temperament, confirmation, fertility, weight gain, mothering and survivability. These cattle are bred in mountainous country where watering points are sparse, therefore they must possess good walking and foraging abilities which gives rise to the stud motto of “survivors when the going gets tough”. 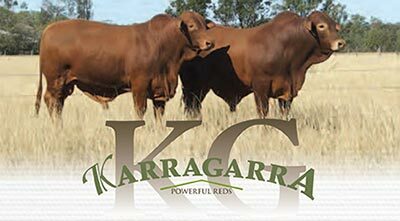 Over the years, Strathfield has introduced fresh blood from such well-known herds as Redskin, Redwing, Mungalla, Wingfield, Greenacres, Billabong, Garthowen, Glen Houghton, Huntly and Kenlogan. This combination of introduced genetics into our solid female base has helped the Strathfield stud prefix to figure prominently in the pedigrees being chosen by both stud and commercial breeders. Strathfield 9JE is owned and operated by Brodie and Josh Perry. This new stud has taken its knowledge and breeding from the great work of the parent stud of Strathfield. Strathfield 9JE has not only purchased great sires for their herd, but have bred a beautiful line of bulls and females making them a stud to keep your eye on. Wajatryn Pastoral Company and Droughtmaster Stud is a family business, owned and worked by Warren and Carolyn Kenny and our family. We both come from four generations of cattle breeding experience. Breeding great cattle has always been the love and livelihood of both of our families. Establishing our own business when we married in 1987, it is now run over four properties in the Central Burnett area of Queensland. We take great pride in the cattle we breed. We sell around 120 bulls a year direct from our Gayndah properties as well as a line of our lead bulls at the Droughtmaster National each year. We are first time vendors at the Highlands Sale in 2018 and very much appreciate the invitation to offer Wajatryn Bulls at this sale. 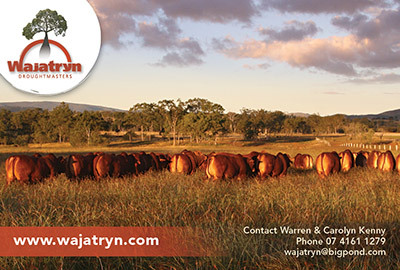 ​Wajatryn cattle have been selling across Australia for over 30 years – JBAS 7, WA eligible. As proven performers, we base our success as seedstock producers on the commercial relevance of our entire business. Inspections of our cattle, on property at Gayndah is welcome, year round. Since 1975, we, the Edwards Family, have run a commercial Droughtmaster herd, and in late 1998 we founded Tiggabon Stud however due to family succession we were forced to change the stud name and subsequently called it Wolfang. Wolfang was originally a British Food Corporation property put up for ballet in 1954 of which my family was fortunate enough to draw two blocks, which we still own today. The Wolfang Stud breeding herd is located at “Macintosh” Rockhampton however our bulls are prepared for sale at “Ivanhoe”& “Cooeeall” both via Wowan. 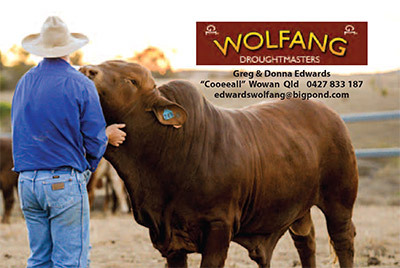 Wolfang Droughtmaster bulls have been very sucessful selling to both stud and commercial cattle producers. We are honoured to achieve world record price for a droughtmaster Registered bull in 2007, Wolfang Fred-o, who sold for $150,000. Throughout the year, bulls are sold at varies sales including, Highlands Sale in Clermont, Droughtmaster National Sale in Rockhampton and the Central Reds Sale in Emerald. Paddock Sales are available all year round. Our aim is to breed quality cattle suited to call aspects of our beef industry.